Let’s face it: There will always be some sort of line when you visit Walt Disney World (unless you visit on a really rainy day and magically manage to get a photo of Aloha Isle with no line. But that’s another story.) So what can your tween or teen do while their younger siblings are queued up in a goodie line or a character meet and greet? People Watch! My tween daughter loves checking out other visitor’s costumes and has even made a few new Disney friends while waiting in line at the party. 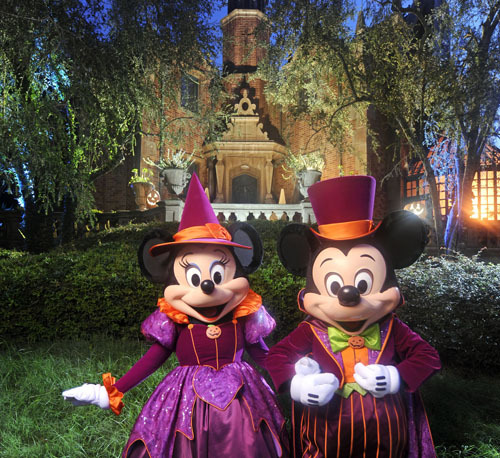 Visitors from all over the world love going to Disney at Halloween and The Kid adores pointing out their elaborate costumes. She’s even come up with ideas for next year’s costume while people watching. Or you and your tween or teen can have a seat on Main Street and watch the party crowd stroll toward Cinderella Castle. After a full day in the park plus and a long night ahead of us, it’s a blast to just sit and take in the sights, sounds, and smells of the most magical place on earth! 4. Let Them Eat Cake! Or Cupcakes! Or Popcorn! Or a Mickey Premium! I’m sure you all know that tweens and teens are insatiable when it comes to food; I know I hear, “Mom, what’s in the fridge to eat?” at least a dozen times a day. 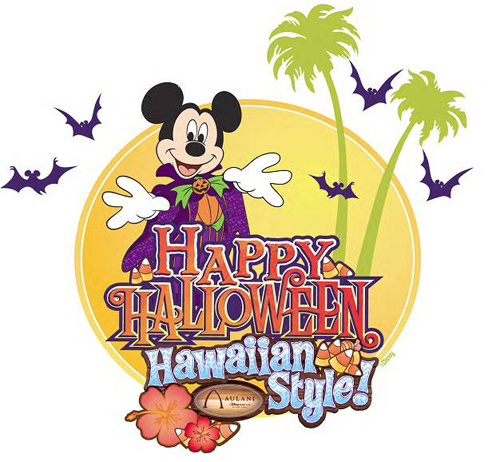 Mickey’s Not So Scary Halloween Party has so many tasty options from table service to counter service to snack carts no fewer than a 60-second walk away from each other that it’s easy to give them what they want- fun food! The Kid loves the fun Halloween-themed goodies in Magic Kingdom and I find it easy to splurge when it comes to caloric intake at Disney. I mean, Disney sprinkles pixie dust on all of their food and makes them calorie-free, right? Wishful thinking. Tweens and teens may try to act more mature, but one glance at yours when they’re watching Hallowishes (or if you’re a stickler for details its official title is Happy HalloWishes: A Grim Grinning Ghosts Spooktacular in the Sky) and you may just see that tiny tot from years ago in their eyes. There’s plenty of viewing spots, our favorite being right in front of Cinderella Castle. Although, we have watched them from Astro Orbiter and they were pretty amazing, too. One of The Kid’s top requests when we visit the Magic Kingdom at Halloween is to watch Mickey’s Boo to You Halloween Parade. Yes, we all end up singing the VERY catchy tune for hours and even days afterwards and The Kid loves to somehow manage to start singing it at the very moment I’ve forgotten about it, but the parade is a blast! 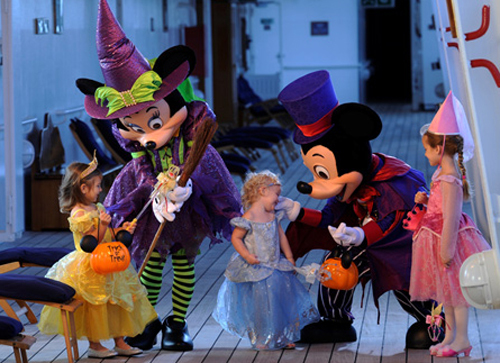 She loves seeing Disney characters in their Halloween costumes dancing and singing, especially the villains. It’s always a joy for me to watch her stick her hand out at the very end of the parade for a lollipop from the cast members with Goofy’s Candy Company. While you’re waiting for the parade to begin, take advantage of Disney cast members that love to take photos and encourage your tween or teen to act silly while having their photo taken. It always works for us. This has always been on the top of The Kid’s list. Most families are taking their kids around to meet and greets or queueing up to add to their candy haul, but we find the best time to ride the popular rides at Magic Kingdom is during Mickey’s Not So Scary Halloween Party! We head for the Mountains and generally walk right on and then hit Haunted Mansion at least a half-dozen times. The HM cast members go all out for the party as well, and she adores how they look “antiqued”. If you’ve got older teens that like to head off on their own and you are comfortable with it, they’ll have the time of their lives riding the popular MK rides without much of a wait. As for Disney character meet and greets, the bulk of the partygoers will be getting autographs from The Seven Dwarfs and Jack Skellington and Sally, so feel free to head for daily meet and greets that you didn’t want to wait in line for during the day. We were able to walk right up to Merida from Brave, get a few pics, and were headed back to the party in under 10 minutes. 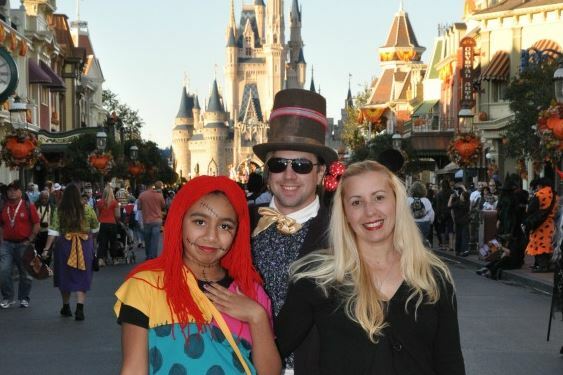 How do you keep a smile on your tween or teens face at Mickey’s Not So Scary Halloween Party? I’d love to hear your suggestions! David Letterman isn’t the only one with top 10 lists. Here’s where you can get your villain fix! 1. Maleficent from “Sleeping Beauty.”– Catch her in Fantasmic! over at Hollywood Studios. When she transforms herself into a dragon and sets the river on fire, it’s one of the most awesome moments in the entire nighttime spectacular. You can also see her in the Dream Along with Mickey show at Magic Kingdom. 2. Captain Hook – The Dream-Along with Mickey show at Magic Kingdom Park, as he and Mr. Smee face off against their old nemesis. 3. Ursula – Before New Fantasyland, we’ve been able to go “Under the Sea” with Voyage of the Little Mermaidat Disney’s Hollywood Studios. 5. The Queen from Snow White– Catch her in Fantasmic! 6. Governor Ratcliffe – He’s in Fantasmic! too. If you remember, he is the self-serving villain from “Pocahontas,” who is greedy and wants gold! 7. Lady Tremaine – Cinderella’s stepmother and her two awkward daughters, Anastasia and Drizella. 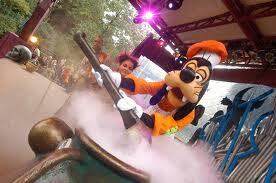 They do character meet and greets in the Magic Kingdom. You can also find them during character dining times over at 1900 Park Fare Restaurant in the Grand Floridian. 8. Gaston – Gaston takes part in Beauty and the Beast – Live on Stage at Disney’s Hollywood Studios, and beginning this fall, you’ll actually have a chance to meet him when he begins making regular appearances outside Gaston’s Tavern in New Fantasyland. 9. Evil Emperor Zurg – look for him at Buzz Lightyear’s Space Ranger Spin (attraction) in Magic Kingdom! 10. Headless Horseman – Nothing says Halloween quite like “The Legend of Sleepy Hollow,” and no villain is more ominous than the Headless Horseman, who makes special appearances ONLY during Mickey’s Not-So-Scary Halloween Party at Magic Kingdom Park.